Dune is found in the greater region of Anequina, which consists of the northern-half of Elsweyr. Dune, in particular, is found near both the borders of Valenwood in the west, and Cyrodiil in the northeast. To the northeast, near the exact border to Cyrodiil lies Fort Sphinxmoth. 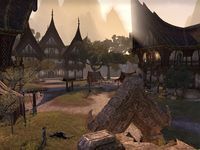 Which was established to control the feuds between both the Khajiit and the Wood Elves, though it would waver between control, either by the Empire of Cyrodiil, or one of the warring tribes. Khajiit settlements are found throughout the surrounding region of Dawnmead, such as Pa'alat and the Thizzrini Arena, the latter which uses old Imperial forts as its basis. The ruins of Jode's Light and Fardir's Folly dot the landscape. The Crescent River, which makes up the border between both provinces, can be found west of Dune, below a hill where the Thizzrini Arena overlooks the area. Dune is neighbored by several settlements, including Cori Darglade in the east, Ein Meirvale in the southeast, and Verkarth Hills in the south. Dune is a large metropolis built on the hills that lead into the rest of Anequina. Dune is heavily-fortified, but not without its artistic attributes. The high walls and battlements of Dune are ornate, with crescent moons adorned across the walls. But despite this, Dune's walls are made out of wood, with some buildings falling into disrepair. But regardless, Dune continues to stand. The doors in Dune are decorative. The streets and thoroughfare have painted pavilions and decorative statues. They are also very clean for what it is, dung-free but with constant traffic from herders. Dune is also known for teahouses, such as the Sweet Plethora teahouse. Dune is also the home of the Moon Sugar Press. Like the rest of Elsweyr, there is a Temple of Two-Moons Dance in Dune. Dune is split into three districts. A temple district with chantries dedicated to Jone, Jode, and Lorkhaj. A merchant district in the north for local guilds, as well as, various artisans. And a residential district, found in between the previously mentioned districts and the Temple of Two-Moons Dance. There are thoroughfares that run through the borders of these districts. Dune's founding is unknown. In the early Second Era, the Second Empire had established Fort Sphinxmoth in Reaper's March, created to maintain peace in the area so that it would not interfere with trade in the north, around Skingrad. But as the Empire had fallen into disrepair, so did the Border Scouts that protected the land, and Dawnmead returned to its natural state. The Vinedusk tribe and the Dakarn clan waged war against each other in Reaper's March, taking refuge in the ruins of Sphinxmoth and ransacking merchant caravans. As time went on, both factions had subsided. The Vinedusk had staged a raid at Arenthia but overreached, and the Dakarn took to organized at Dune and Thizzrini Arena. Brigandry had ended in Reaper's March as people on both sides of the region formed militias and swept the hills clean of bandits. The Vinedusk reformed into the Vinedusk Rangers and the remaining Dakarn turned into the Duneguard Outwalkers. Reaper's March would return to peace. In 2E 560, the Knahaten Flu had begun to spread across southern Tamriel and into Elsweyr. It had begun at the docks in Alabaster, and it eventually made its way into Dune. As time went on, various figures in the province were slowly able to defeat the disease, and save the people from nigh extinction. One such person was Ubraz, who was considered one of the best alchemist in Dune. His entourage was sent to Orcrest in 2E 565, but the disease was too potent, and so the group was claimed by the flu. At the time, the Lunar Champions, Khali and Shazah were cubs, with the latter being present in Orcrest with her father. The city-state of Dune was made a part of the First Aldmeri Dominion when it formed in 2E 580. In 2E 581, on the 21st of Sun's Height, Dune was one of the first settlements to be attacked by the Daedric forces of Molag Bal, when a Dark Anchor had formed outside of town. Daedric Titans had razed Dune in hellfire, and legions of Dro-m'Athra had swarmed the streets. The settlement was successfully able to defend against the Daedra, with the help of a group of hunters that worked for the merchant-lord Zagun-ra of Dune. During the Interregnum in 2E 582, the city-state of Dune was attacked once again by the Daedra. This time, under the command of Javad Tharn and the Stonefire Cult. Queen Ayrenn's forces were attempting to retake the city, until both the Lunar Champion and the Moon Hallowed had arrived in Dune. Once they had, the two were able to drive out the Daedra, using the Sacred Khajiit Fang to close portals across the city. Both the merchant and temple districts were liberated by the Daedra. Dune was reclaimed by the Aldmeri Dominion. Finally, both the Lunar Champion and the Moon Hallowed would walk the Two Moons Path, to complete the final trial and ultimately, confront Javad Tharn. At the end of the path, the two approached Javad Tharn and the Dark Mane in the Den of Lorkhaj. In the end, the two prevailed and the Colovian invasion of Reaper's March was over. The Lunar Champion was named the new Mane. During the Imperial Simulacrum in the late Third Era, the city-state of Dune was an active settlement, being ruled by King Ab'ir. It had a rivalry with Riverhold. The land surrounding Dune and Fort Sphinxmoth was where the northern skirmishes of the Five Year War, between Valenwood and Elsweyr, took place. Arena was originally conceived as a fighting game featuring a tournament that took the player to each of Tamriel's cities to challenge different gladiatorial teams. According to a file from that stage of development left behind in the final game, Dune's gladiatorial team would have been called "the Blades". [UOL 1] The name "the Blades" was later reused and became the current Blades. This page was last modified on 17 February 2019, at 17:22.